Property : You must be a mage to become attuned to this item. The staff has 10 charges. As an action, you can expend 1 charge and cast one of the spells contained within the staff: charm person, command, or comprehend languages. If you expend the staff’s last charge, roll a d20. On a 1, the staff blackens and loses this property. The staff cannot regain charges and functions as a normal quarterstaff. The staff regains 1d6 + 4 expended charges each day at dawn. 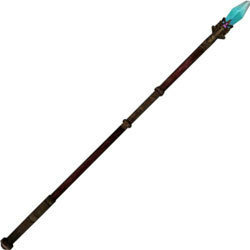 Secret: The staff’s secret is revealed to its wielder the first time that person is the target of an enchantment spell. Once per day when you fail a saving throw against an enchantment spell, you can turn the failed saving throw into a successful one. Furthermore, you can expend 1 charge as your reaction to turn that enchantment spell against its caster, as if you had cast the spell yourself.